Out-of-town visitors… Don’t you love ’em? I do. Especially when they’re fun folks like the Blarneyman and his Blushing Bride. Whenever they visit it’s a great excuse for our Band of Craft Beer Enthusiasts to get together and enjoy some libations (not that we really need an excuse). Wherever we end up we have a good time together. Blarneyman and his Bride had arrived the night before but since that was a Thursday I elected to stay home because I had to work the next day and Thursday night usually involves karaoke. And karaoke usually involves more beers than I. See on a Thursday night. By the time Friday afternoon rolled around I got a text from Rowdy inquiring about Happy Hour. I suggested Loosey’s and she came back with 430 and I passed it along to the others. If you haven’t been to Loosey’s then you either haven’t been in Gainesville long or you’ve been dead for a while. This is what Gainesville residents would refer to as a local legend. 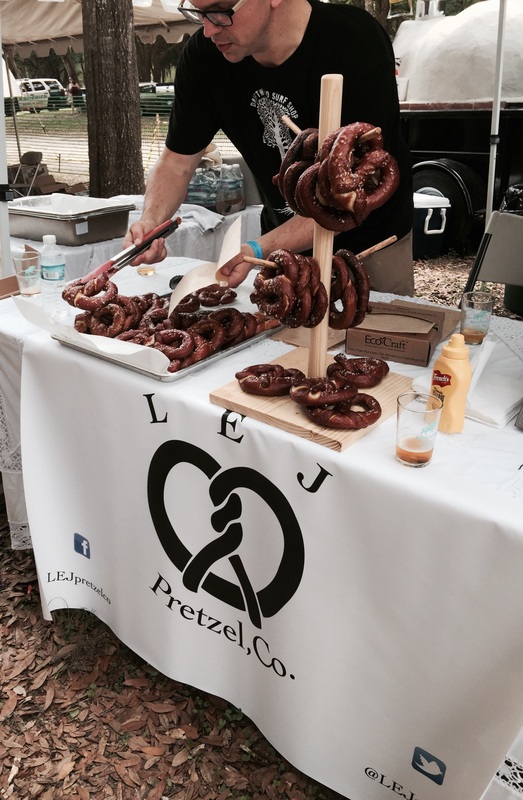 Located in the heart of downtown Gainesville it has always been known for drinking and entertainment but in recent years it has also been known for good food as well. Now I can’t speak to their other food as the only thing I have eaten there are their fish and chips. But they’re the best fish and chips in Gainesville. Since I don’t eat there that often I have a tendency to get the one thing I know they do best and that no one else can do as well yet. Loosey’s also has a large number of craft beers on tap as well as bottles. Their selection may not be as varied as say House of Beer, BrassTap or World of Beer, but they do try to offer varieties that you mind not find elsewhere in town. I started off with Blue Point Brewing’s Spring Fling, which a pretty well balanced American Pale Ale. The Doctor arrived, followed shortly by Rowdy though she didn’t have the Cooler with her as he was off “huntin’!” We grabbed a little table and began philosofying about our past week. Soon enough I was ready for another and ordered Sweetwater Brewing’s 18 Belgian Style Tripel Ale which was potent but smooth tasting. Not long after that the Maestro arrived with the Blarneyman in tow. We all decided on a bigger table and found one nearby. The Doctor, Rowdy and I checked out the menu while the Maestro and Blarneyman ordered some drafts. 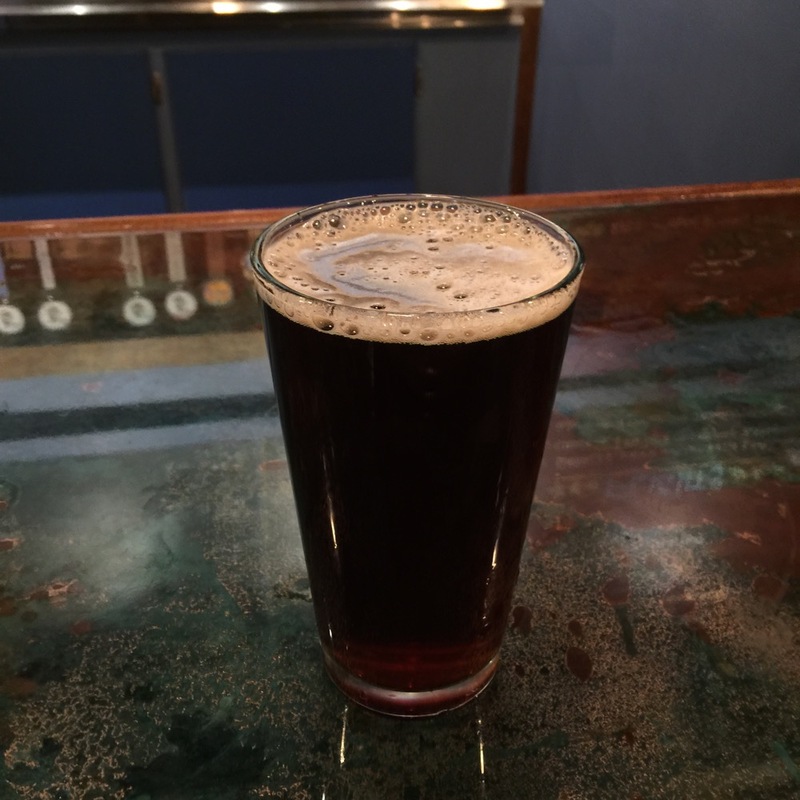 I tried someone’s Terrapin Ale Special Project and did not care for it at all. 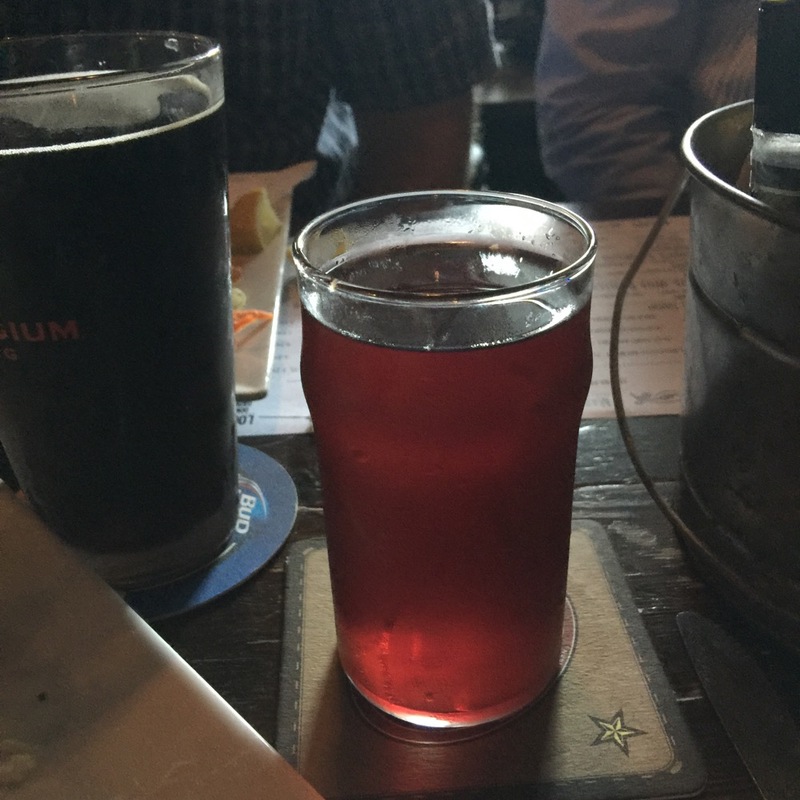 So with my food order of fish and chips I ordered Founders Blushing Monk, a fruit beer, to help get rid of the taste. Sometimes I like fruit beers and sometimes not. I really liked the Blushing Monk. And it pared well with the fish and chips. Did I mention yet that they have the best fish and chips in town? So we drank craft beers, ate fish and chips (Rowdy kept stealing my chips – did I mention these are the best fish and chips in town? ), and philosified. Blarneyman ordered another round of the same beers we were having so I had another Blushing Monk which I found out is a 9.2% beer. By the time we finished the food both Rowdy and the Doctor had to leave. 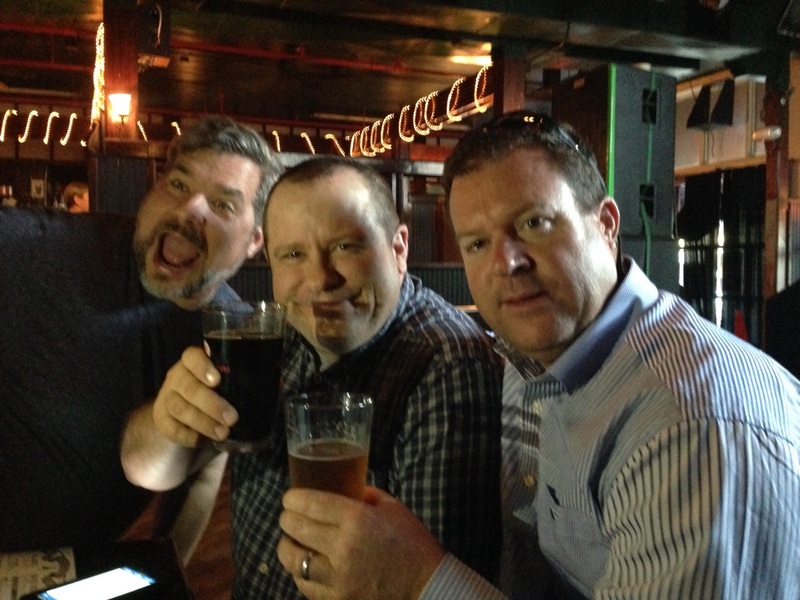 So the Maestro, Blarneyman and I continued on to First Magnitude Brewing. Parking was at a minimum there so once we all finally stowed our vehicles away, we made it inside to find that despite the full parking the wait to get drafts wasn’t too long. Blarneyman hadn’t been here since they opened the beer garden so we headed outside to enjoy the nice cool breeze. I had the Big Shoals American Brown Ale. I believe the Maestro and the Blarneyman both had the Time Out Stout, which is also a really good First Mag brew. By the time we had finished these beers it was late enough for me to go home and take the dog for a walk. We had all agreed with Rowdy and the Doctor to go to the Tree Fest at Swamp Head Brewery the next day so I said I’d see them then and headed home. 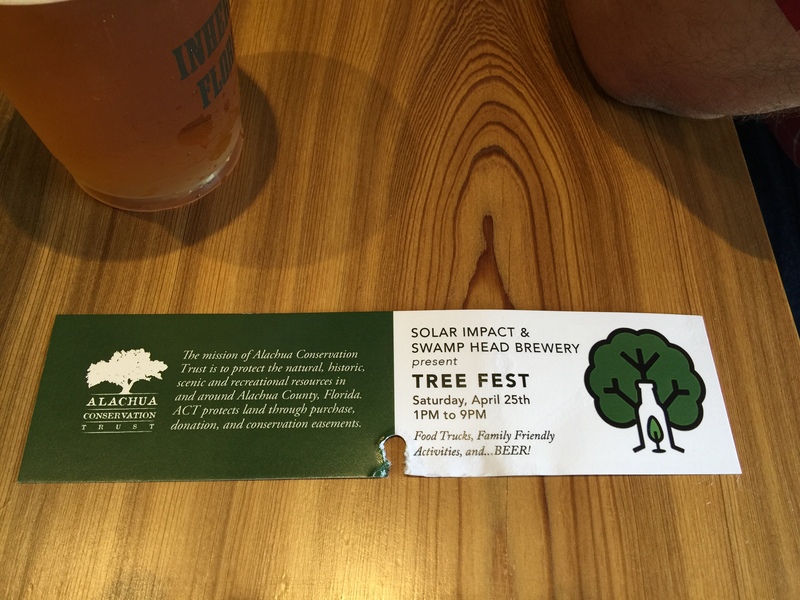 Swamp Head Brewery began the Tree Fest at 1 PM, so the Doctor, Rowdy and I decided to meet there around then. 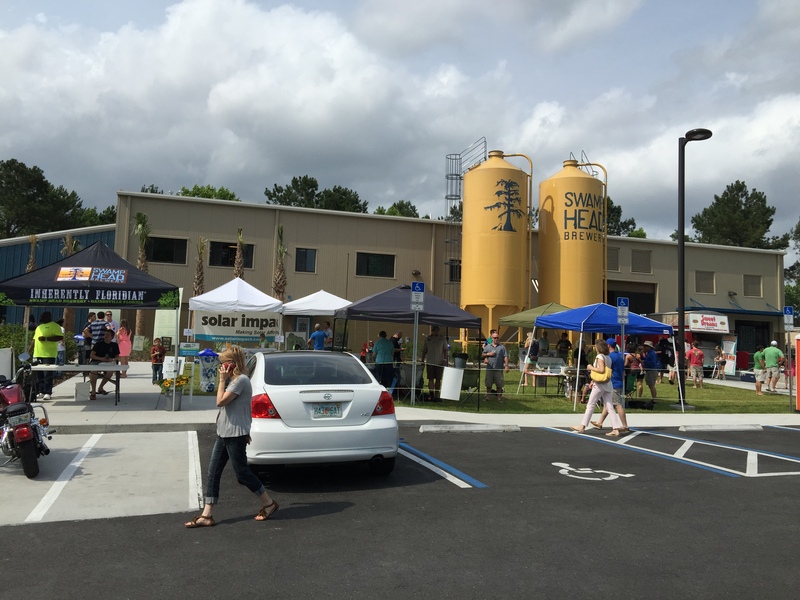 The Brewery grounds were covered with three food trucks, a couple of bounce houses for children, and some information booths. It was nice outside but the threat of rain was in the air and tornado warnings weren’t that far away.ant over 5,000 trees with money raised by Tree Fest. 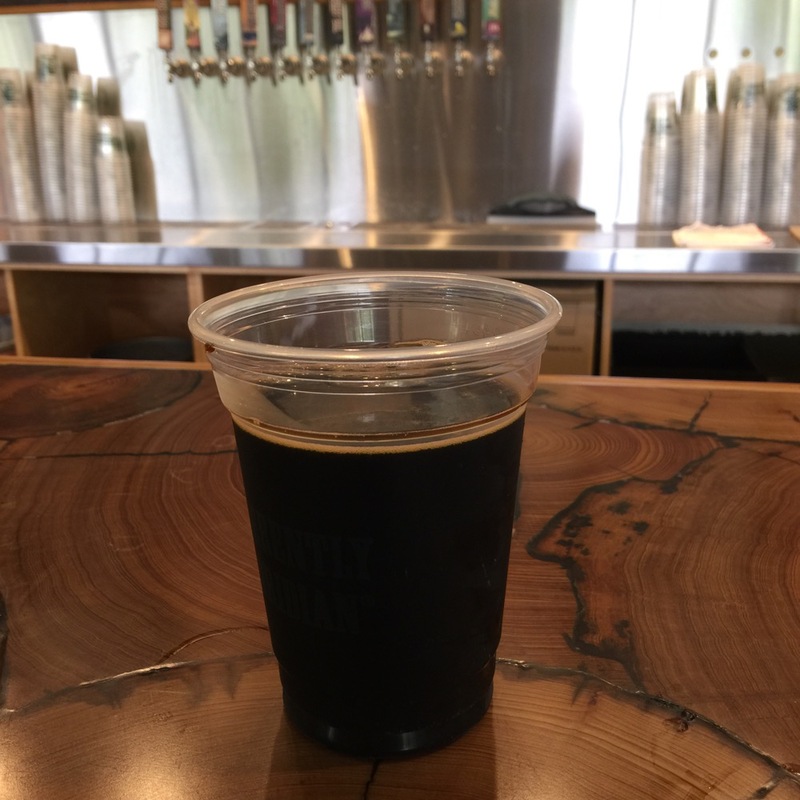 The Doctor and I both started out with Swamp Head’s River Logger, which is a black lager, and quite tasty. I moved on to Catherine’s Wood, a Russian Imperial Stout. If you’ve read any of my blogs before you know I enjoy a good stout and this one is one of my faves. Rowdy decided to get a Lobster Roll from Monsta Lobsta food truck which she loved. About the time she finished eating that I noticed a couple at a nearby table playing some kind of game that required holding your phone up to your forehead. 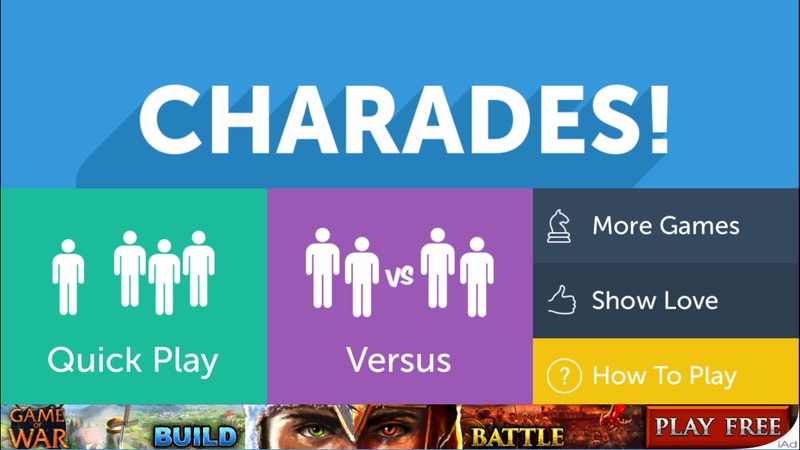 I was intrigued so I wandered over and asked about it, and was introduced to the Charades App for phones. After I downloaded it, Rowdy and the Doctor and I played it for a bit. It is really addicting and is a fun way to pass time while you’re supping some suds. After we finished that first round, the Maestro and Blarneyman showed up with their respective spouses. Blarneyman has his Blushing Bride and the Maestro has his Muse. If you know these ladies you will understand why I picked these names for them. Blushing Bride is a warm friendly lady who always seems to have a smile on her face, especially when she is around Blarneyman. And the Muse (or in ancient Greek the Mousai) in Greek mythology, poetry and literature, are the goddesses of the inspiration of literature, science, and the arts. This lady is not only wise and musically talented but gifted at sharing these talents. They entered carrying saplings being given away by the Alachua Conservation Trust. So we spent the next hour or so, catching up, playing Charades, philosifying, and supping suds. It was an enjoyable afternoon where our activities helped the environment, the money we spent was for local businesses, and we spent our time in good company. On the way out, both the Doctor and I had to stop and get some ice cream cones from the Sweetdreams food truck, a perfect topper for the afternoon. If you get the chance to attend a similar event at Swamp Head in the future, I suggest going, especially if you can go and meet friends there. If not, then go and make some new ones. And if you have never been to Loosey’s Downtown, then what in the hell are you waiting for. Did I mention I love their Fish and Chips? Let me preface this review by saying that I don’t like lines. And by that I mean lines to get into a movie or a restaurant or night club or bar. If I walk up to place and I hear that there is a wait of more than 10-15 minutes to be seated, 99 times out of 100, I’m walking away and going somewhere else. That’s just the way I am. Very rarely over the last 30+ years of going out to places have I found anyplace worth wasting mine or anyone else’s time to wait to get in. 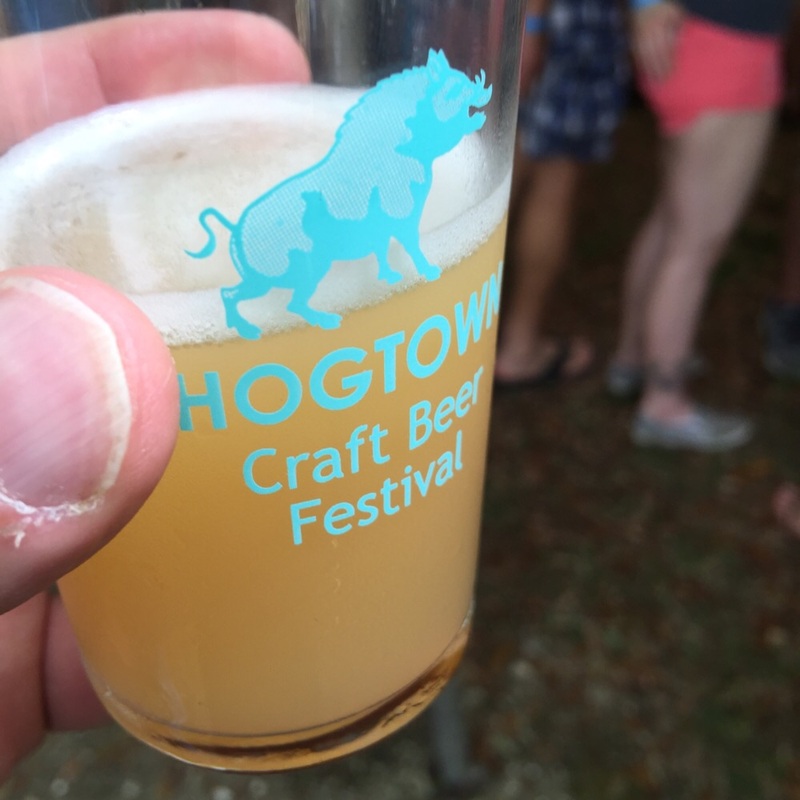 Having said that, I got to the beer fest a little later than I would have liked, the pouring started at 1PM sharp and they let folks enter around Noon. But I didn’t get in line til around ten after 1. The line to check in when I arrived was about 300-400 feet long and it reached from one side of the back square at Town of Tioga all the way to the other side and a bit more (see the pic below). Did I mention I don’t like lines? It took about 20 minutes for my spot in the line to move around to the check-in. Which considering how many people were attending (1400 tickets pre-sold) wasn’t bad. And the line moved at a decent pace. At the check-in the event organizers (the Hogtown Brewers) dutifully checked I.D.s and verified tickets holders, then passed out the sampling glass with the Passbook, a small booklet listing the different vendors and their products and a map showing their location. 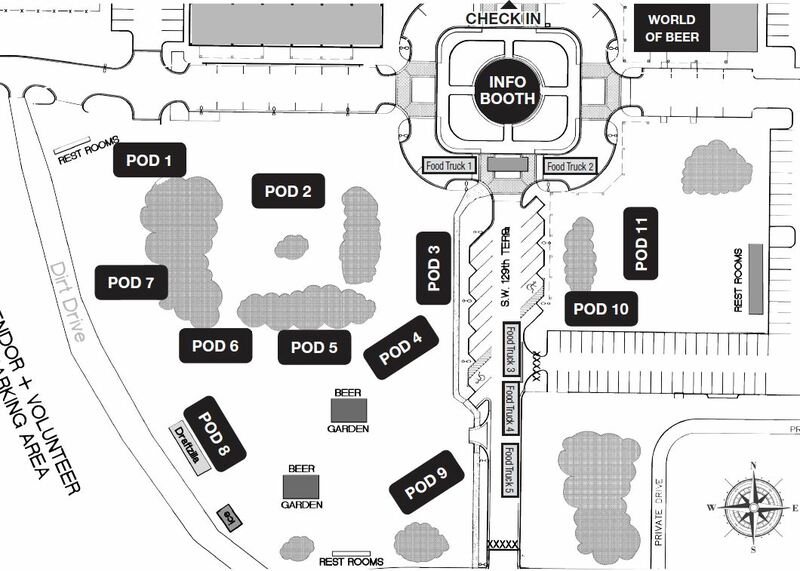 Immediately after the check-in tables was a guy dressed in some kind of Incan Sun-God King outfit (at least that was what it appeared to be to me) pouring out samples of Bold city Killer Whale, a Cream Ale, which seemed kind of timid for a craft beer festival. But then if you’re someone who is not familiar with craft beer this would be a good crossover beginner beer. But who am I to judge… I once drove 4 hours just to get some Genesee Cream Ale, and one of my favorite Swamp Head brews is Wild Night, a honey cream ale. One of my friends, the Blainenator, was helping out at one of the vendor booths and I stopped by the booth to say hi. He hadn’t had a chance to wander around the festival yet. So we decided to explore the festival together for a bit. 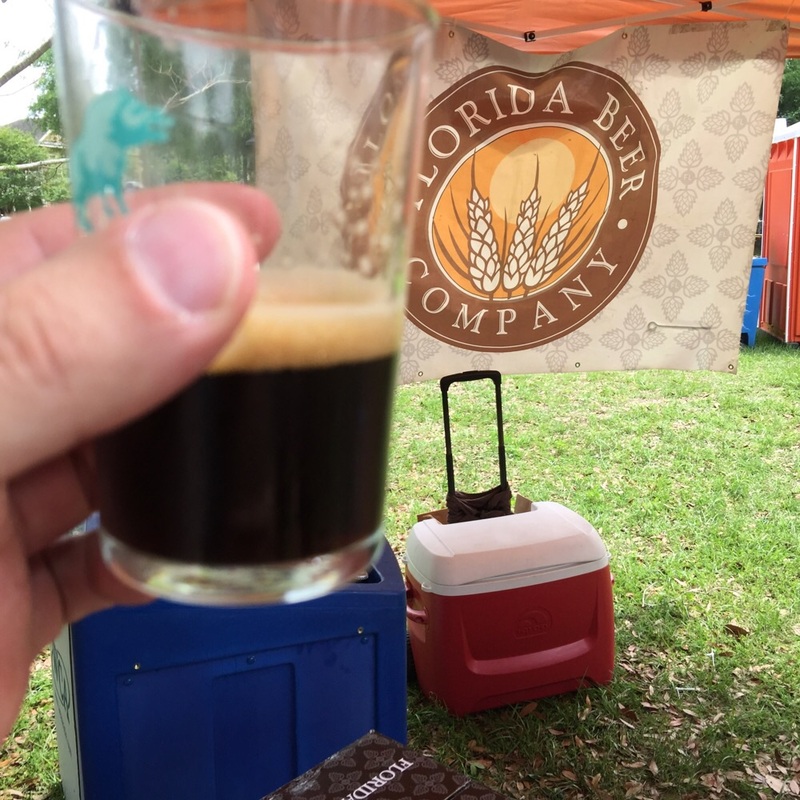 He had heard about a Maple Milk Stout so we went to the pod which had Florida Avenue Brewing. This stout wasn’t in the passbook as one of those they were serving so it was a surprise. and a good one at that. Definite hints of the maple syrup as well as chocolate and coffee hints that a lot of stouts will have were present and it also had a smooth texture. While we were in the same pod, we also stopped at Copp Brewing, where I had the 1821 English ESB, and at Three Palms Brewing where I sampled the Guess Again, which is a sour ale. The Guess Again I thought just ok but then I like some sours and not others. I am, however starting to become a big fan of ESBs (Extra Special/Strong Bitter). Don’t let the name fool you. The ESBs I thought were the best tasting were not overly bitter as the name suggests, In fact, they have very well balanced flavors. Copp Brewing’s ESB is one of these balanced beers. We then wandered to many different pods trying the various samples available to us. The breweries that I had samples from included (but were not limited to): 3 Daughters Brewing, Aardwolf Brewing, Abita Beer, Bell’s Brewery, Bold City Brewing, Brew Bus, Bugnutty, Cigar City Brewing, Copp Brewery, Engine 15, Florida Avenue, Florida Beer Co., Founders Brewing, Green Flash Brewing, Intuition Brewing, Left Hand Brewery, Lost Coast Brewing, Motorworks Brewing (soon to be covered in a review by Rowdy), Ommegang Brewery, Persimmon Hollow Brewing, RJ Rockers Brewing, Sixpoint Brewery, Southern Tier Brewing, Sweetwater Brewing, Three Palms Brewing, and Uinta Brewery. Then of course I had to stop by the locals (Swamp Head Brewery & First Magnitude Brewing). 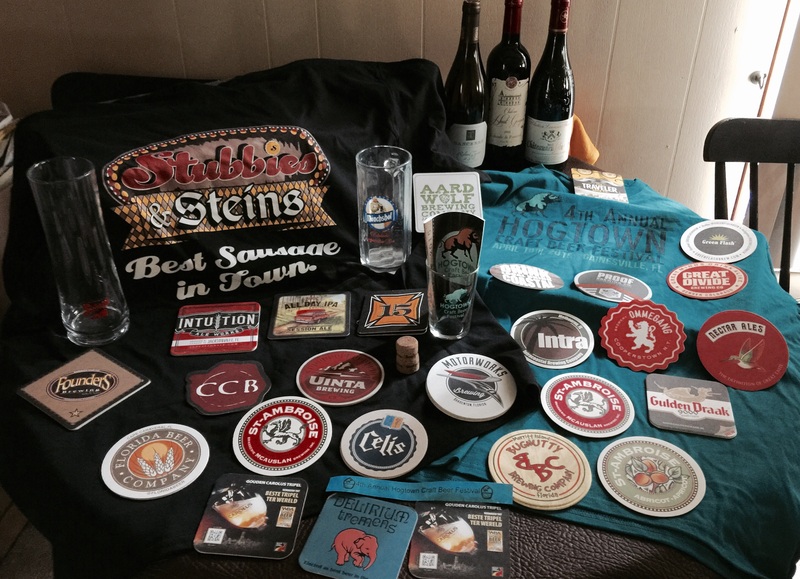 And there were probably three times as many breweries represented that I did not sample. Most of the beers were good, a few were just okay, but none of them made me want to dump it out and wash my mouth out. 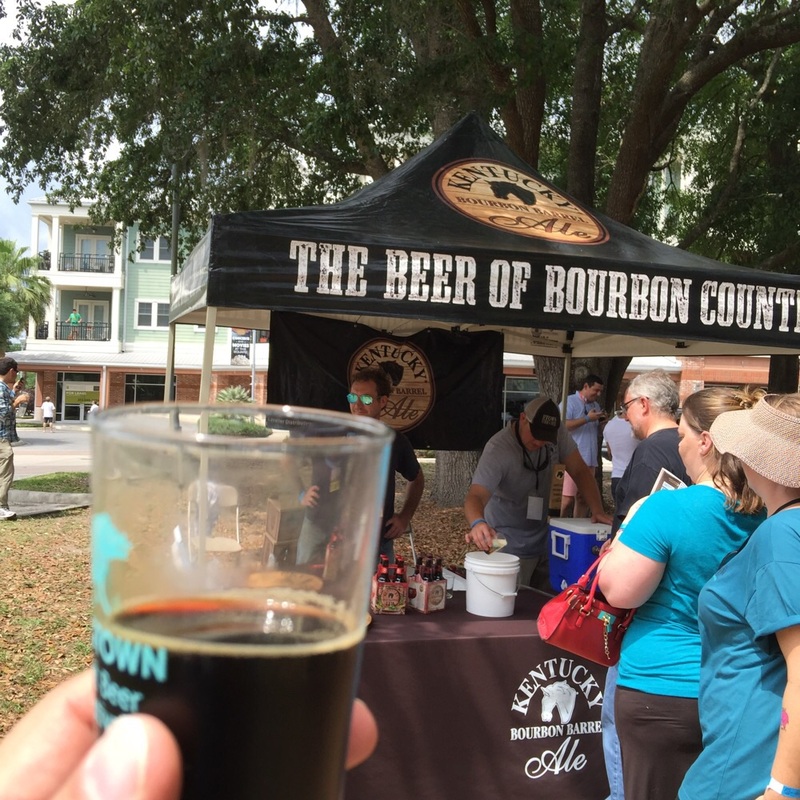 I think the one I liked best for the day was a Kentucky Bourbon Barrel Stout by Lexington Brewing and Distillery. They weren’t even listed in the passbook but I really like stouts and the bourbon flavoring on top of this one was really tasty. The Blaineanator and I got into line for their booth and only had couple folks ahead of us. After we got our samples we turned around and saw the line had grown back about 20 or more people. It literally grew in the blink of an eye. And beer was not the only brew being offered; there were a few (mostly local) vendors who had samples of ciders, meads and some local wines as well. And of course there was the killer 55 foot trailer that was converted into a large multi-tap dispenser. Dubbed “Craftzilla” this beast is a beer drinker’s dream. 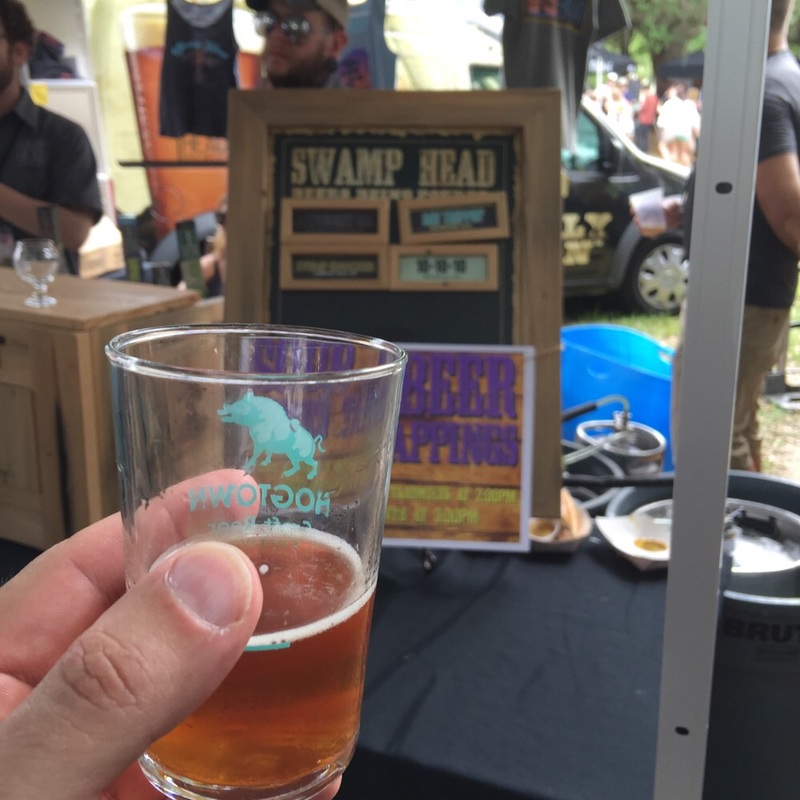 I was very glad to see not only the local breweries (Swamp Head, First Magnitude and Alligator Brewing) being represented, but also some of the local tap rooms, like BrassTap and Gainesville House of Beer. And I was especially glad to see a lot of local food vendors. I’ve been to beer fests where the food vendor is basically Domino’s or Pizza Hut Pizza, a fast food place, and Baskin Robbins Ice Cream. I have nothing against any of these places. But they, in my opinion do not even come close in comparison with the likes of our local places. For pizza you could choose from one of the Food Truck’s which was called Humble Pie (see blog on First Magnitude brewing for a mention of them) and one of Gainesville’s must visit pizza places, Satchel’s Pizza had a booth. The Reggae Shack café had a booth, if you like Caribbean cuisine, and there were several other local food truck vendors. For me there were three highlights as far as food goes for the day. 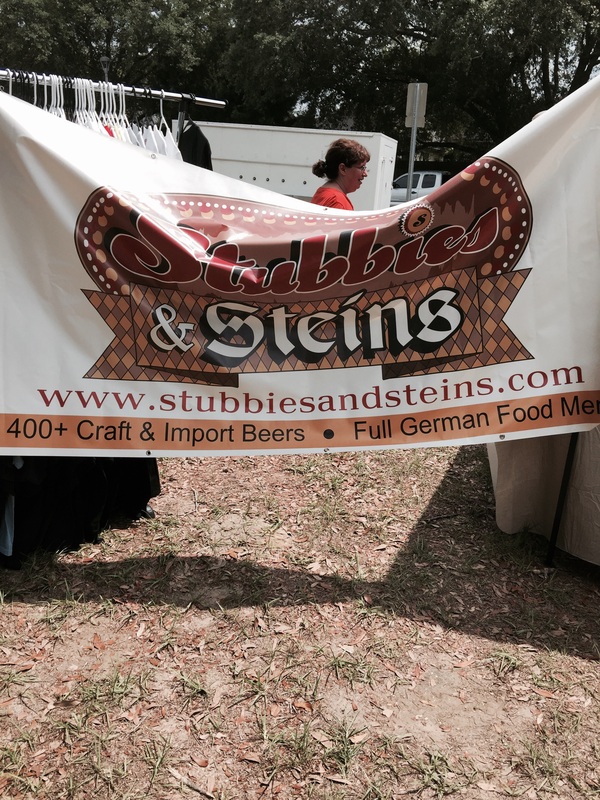 First, Stubbies and Steins, one of the first establishments to bring craft beers to Gainesville and the best german style sausages anywhere, had a booth. This was one of my favorite places for food right up until they closed last year. So seeing the staff from there back serving the most awesomest sausages was a great treat. I also purchased a tee and some glassware from them for memories sake. Hope to see more of them in the future. Third, and while my last vendor mention they are in no way the least, is Sweetberries Eatery & Frozen Custard. I have not had the opportunity to sample any of Sweetberries other foods, but their frozen custard is the best. This time I had their Honey flavored and it was a perfect topper for the other foods and beers I had that afternoon. I could tell that they used good quality honey to make the custard, and not some syrup substitute. The flavor came through that well. After purchasing my custard, I said “bye” to the Blainenator and slowly walked toward the exit of the festival, savoring every bit of the frozen treat. I was half tempted to lick the bowl clean it was so good and probably would have in the privacy of my home. I made my way to the front of Tioga Town center where I had been lucky enough to happen upon a parking space just as someone was leaving, otherwise I would have had to drive to the overflow parking and ride the shuttle back. The one drawback of Tioga Town Center for use of any event is the lack of sufficient parking. I feel bad for the businesses located there when these events happen because it must be a deficit for their customers. I had to park in front of Blue Highway Pizza to find a space. And when I got back to the vehicle I realized that a pizza for dinner would be nice, so I figured since I parked in front of their shop I should at least patronize their business. I ordered a special which was basically their Greek pizza with Tzatziki sauce instead of tomato sauce and the pieces of meat that are normally roasted on a spit (can’t remember the name). It was delicious. 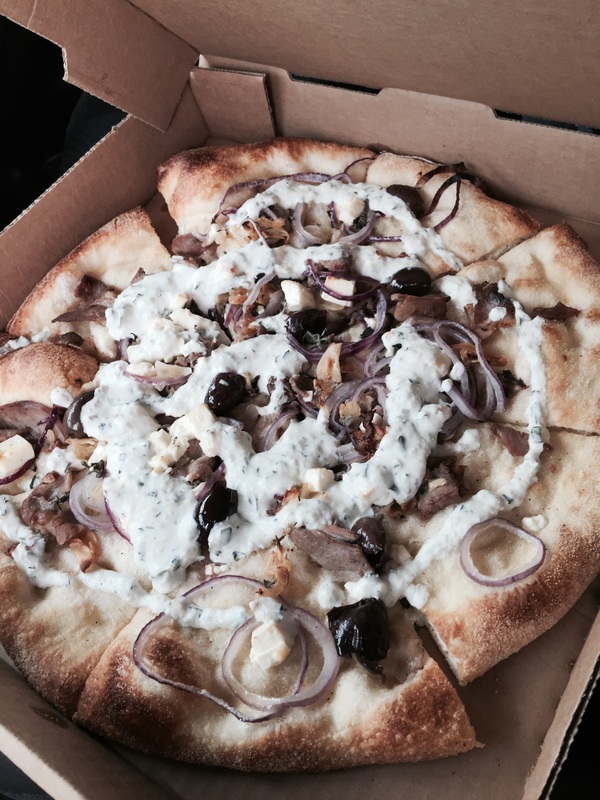 If you haven’t tried Blue Highway (whether this one or the one in Micanopy) you need to. When I got home, before I settled down to eat dinner, I spread out the Swag I had bought or collected (with the Blainenator’s help) which you can see below. Not a bad little haul. Glad I brought a little shoulder pack with me. And if all you want to do is drink your normal everyday Lager and drink it and nothing else, then I agree with you that is what YOU should do. 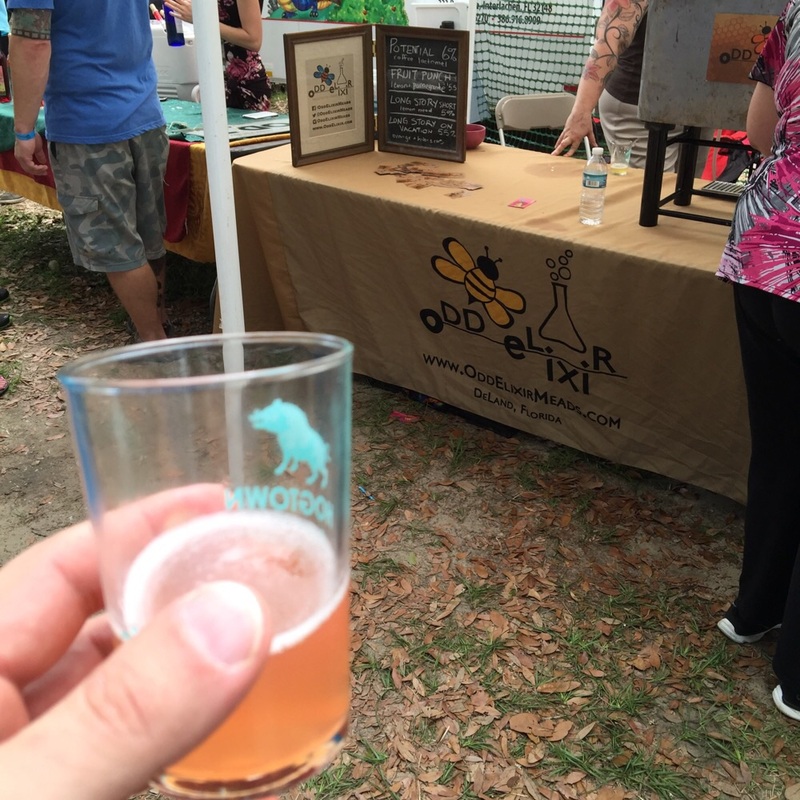 But if you want to be able to sample multiple styles and breweries in one spot, eat some of the best food in Gainesville, and meet some really great folks, then spend the money… it was more than worth it. I’ll certainly be back again next year. 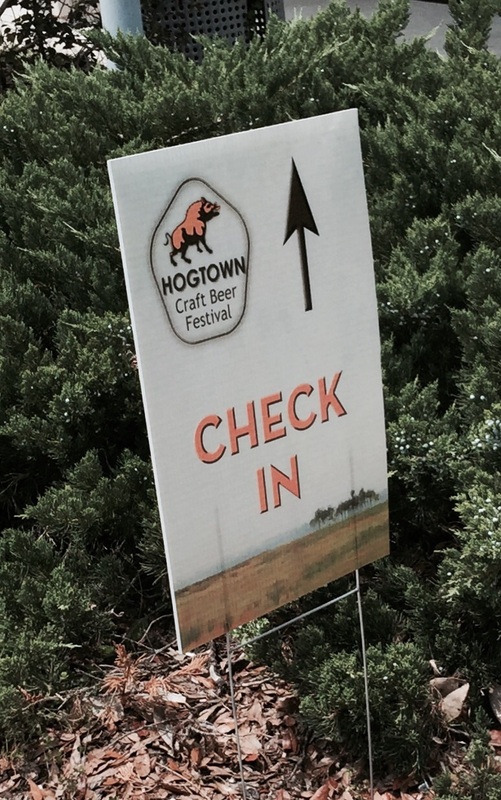 My hat’s off to the Hogtown Brewers for throwing such a great event. 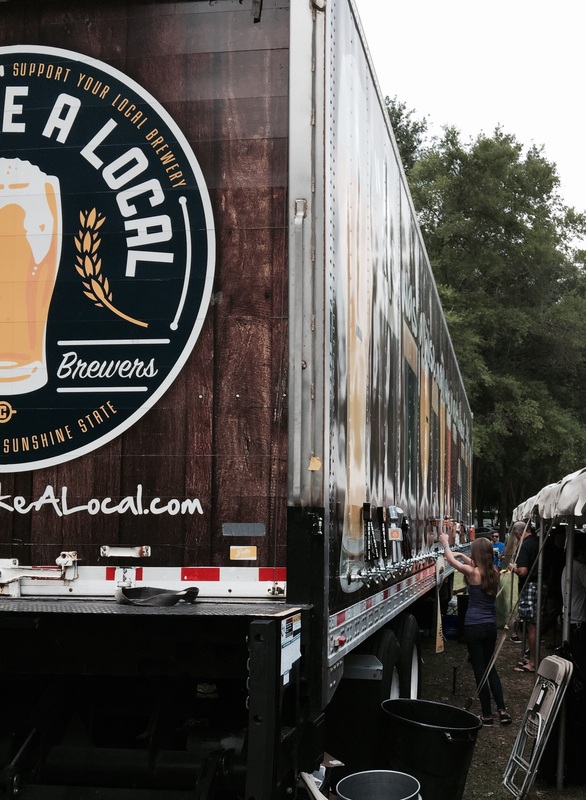 This weekend marks the start of Craft Beer week in Gainesville. There are a number of festivities going on at the various tap rooms and local breweries. 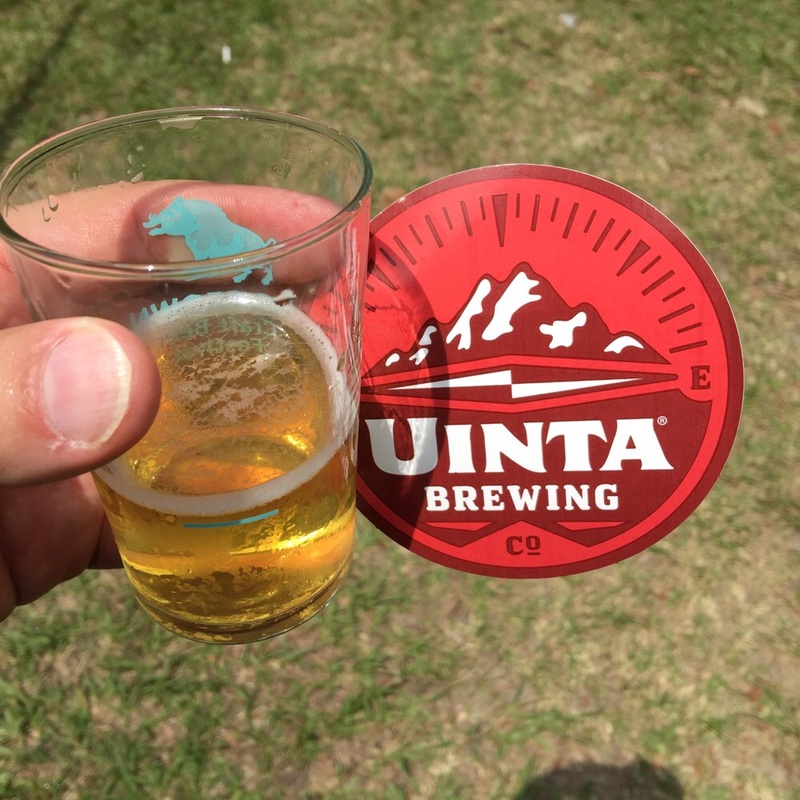 There is even something called the Brew Bus that will take you around town to these various locations so you can sup your suds without the worry of driving. 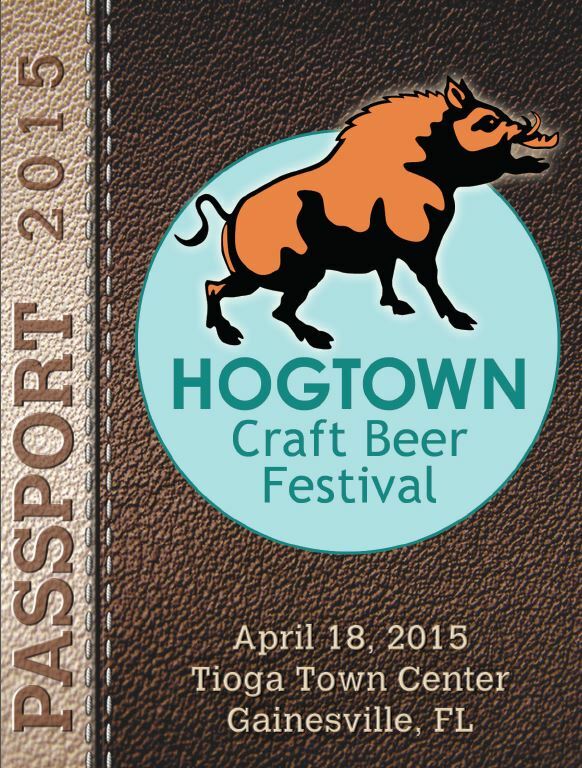 All of this culminating in the Hogtown Craft Beer Festival on April 18th. Already have my ticket and am ready for much beer tasting. With all of that going on you would think that our hardy band of craft beer lovers would be involved in something related to these events last Friday night. Rowdy suggested we try a new place and truth be told I had seen a write-up in one of the papers about this place and thought about trying it myself. It’s called Curia on the Drag and is located near what used to be the Gainesville Animal Hospital. The concept of the place is a Coffee, Tea, Beer and Wine stop. It is intended as a kind of resting place for the local art community and includes a building outback called the “Fermenter”. If you’re reading this then you may have assumed, as I did, that the “Fermenter” was where they would build a micro-brewery. But, like me, you would be wrong. The Fermenter is actually a studio where different artists can go and work on their pieces. So a haven for artists is not where I would normally connect craft beer. But then craft beer could also be considered by some as an art form. It is certainly a creative expression as is most art. I arrived first and was greeted by the director Zack Kennedy. I told him it was my first time there and I was interested in their craft beers and asked what they had on tap. He motioned toward the taps behind and named off all three. That’s right three taps. Now before you roll your eyes and start crossing this place off your list, read on. Zack also mentioned a small refrigerated case on the side of the counter that contained some hard to find craft beers in cans. And he also pointed out a row of bottled beers on display on a high shelf over the counter. All in all I would say he had between 30 and 40 different beers to choose from as well as a couple of ciders and a ginger beer. I had just gotten a draft of JDub’s Poolside when the Maestro joined me. He ordered a Dale’s Pale Ale. Then we went and sat and waited for the others to arrive. We both liked the atmosphere of the place. It’s small and kinda kitschy but it is still a decent place to hangout and start your weekend. 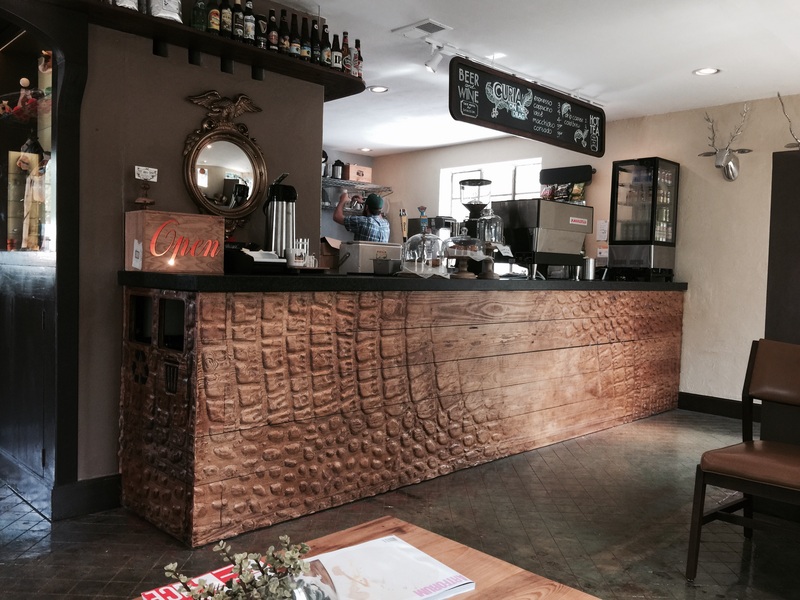 I especially liked the wooden bar that resembles a gator hide (see picture below). Rowdy soon showed up, followed by the Cooler. Then the Newlyweds joined us along with the Lovebirds. Our small party took up a good portion of the shop. Luckily for other patrons they have a small section of the side in the curio area and a little patio as well. I already mentioned coffee and tea and wine as well as beer. 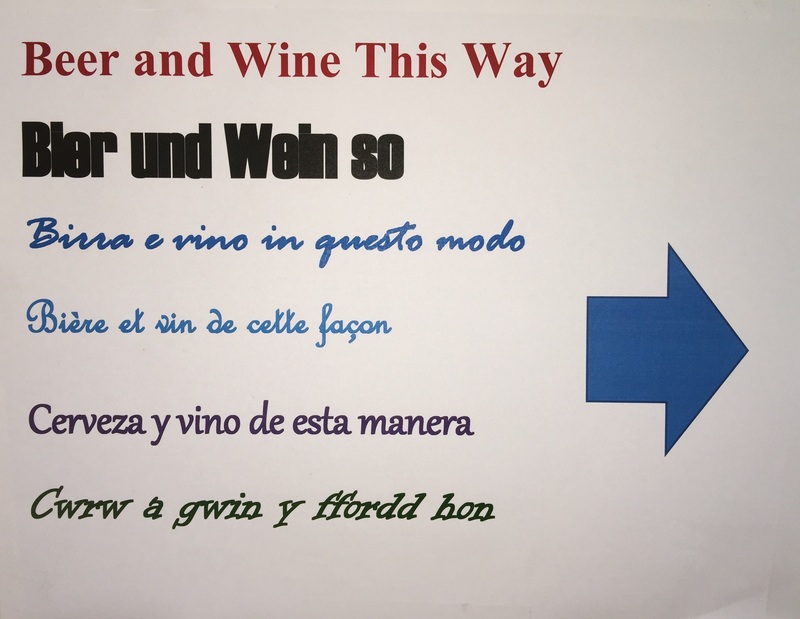 I didn’t get a chance to eye the wine list but I did see the various types of tea they served and they use Sweetwater Brewing for their coffee, which is a locally operated coffee roasting business. 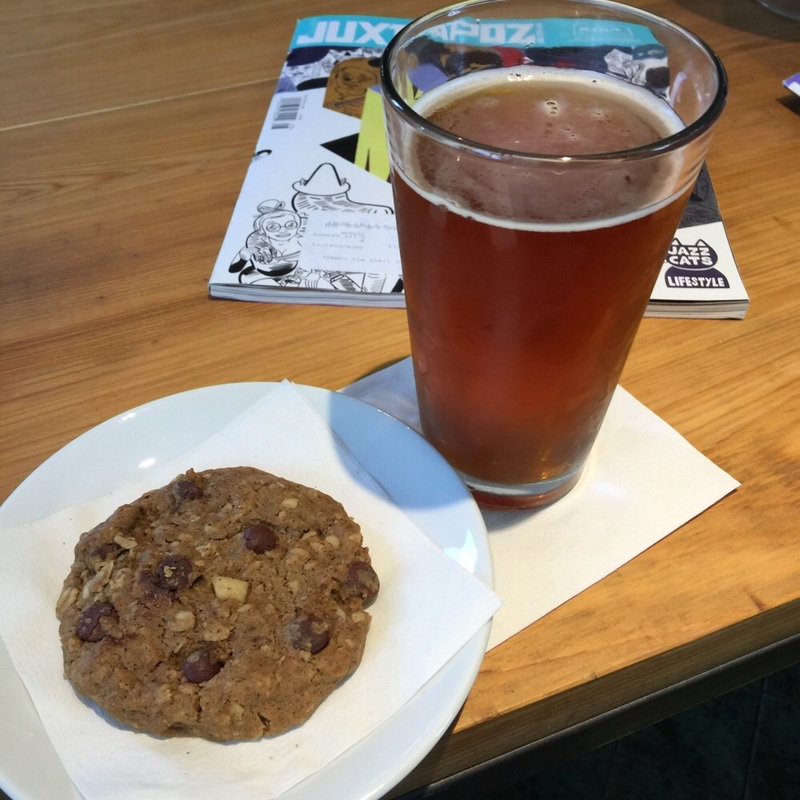 They also have assorted cookies available for munching and I had the Cowboy, which was delicious. Don’t know if they’re made in house or ordered in. Zack was certainly knowledgable about craft beers. And freely shared what he knew about them including recommendations. He and the young lady working with him were certainly friendly enough and helpful. This place is definitely worth a look see and I would go back again. My only concern is the limited number of taps and whether or not any of those and the cans and bottles are rotated out with different selections or whether it is a steady menu. Overall this place scored a big hit for me. 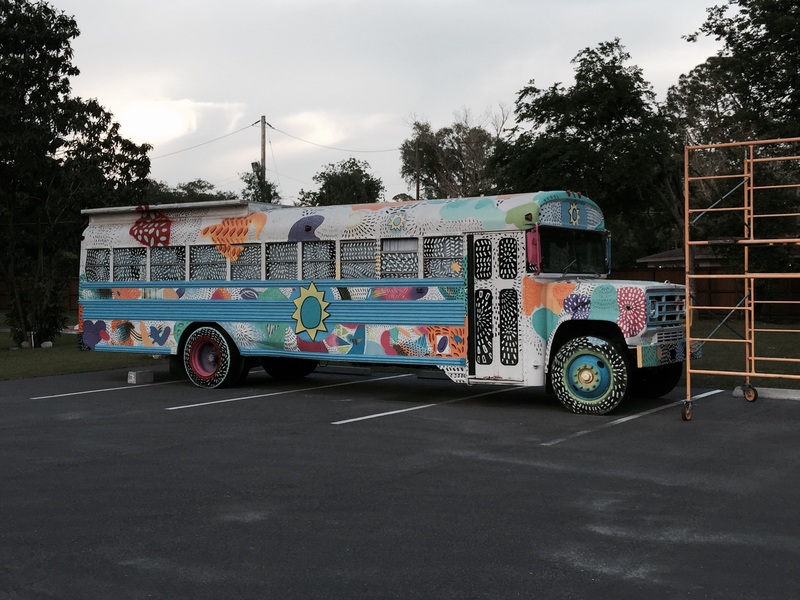 Bus behind curia – artwork in progress? After a couple of beers I believe the Maestro left to go watch the gator baseball game. And not too long after that I felt the need for dinner and declared that “I need to either go home or go get something to eat!” The Newlyweds decided to head home but the Lovebirds, Rowdy, the Cooler and I decided to go for Japanese Steakhouse. I believe I suggested it so what happens next is partly my fault. We went to the closest of the options available to us, the Samurai Japanese Steakhouse and Sushi Bar in the Publix Plaza on the corner of 13th ST & 39th AVE. I had been there once before with an old girlfriend for Sushi which was good. But she had a thing about hibachi bars so we didn’t go into that part of the restaurant. I wanted hibachi because I like dinner and a show. Let’s be honest, the food at a hibachi bar is usually the same no matter what bar you go to. The difference is in the cooks who work the hibachi. The flare of the knives and the interaction with the customers is what sets them apart. Being an amateur cook I appreciate and take note of their techniques. I think I remember hearing the hostess say that they had a big party getting ready to leave but I can’t swear to that. After a small wait (not even five minutes) the five of us were seated at the hibachi with two other couples, one of which had a small boy with them. Rowdy said that was awesome because when there are kids at the hibachi the chef will show off a lite bit more. I agree. The waiter came and took a head count and got our drink orders. 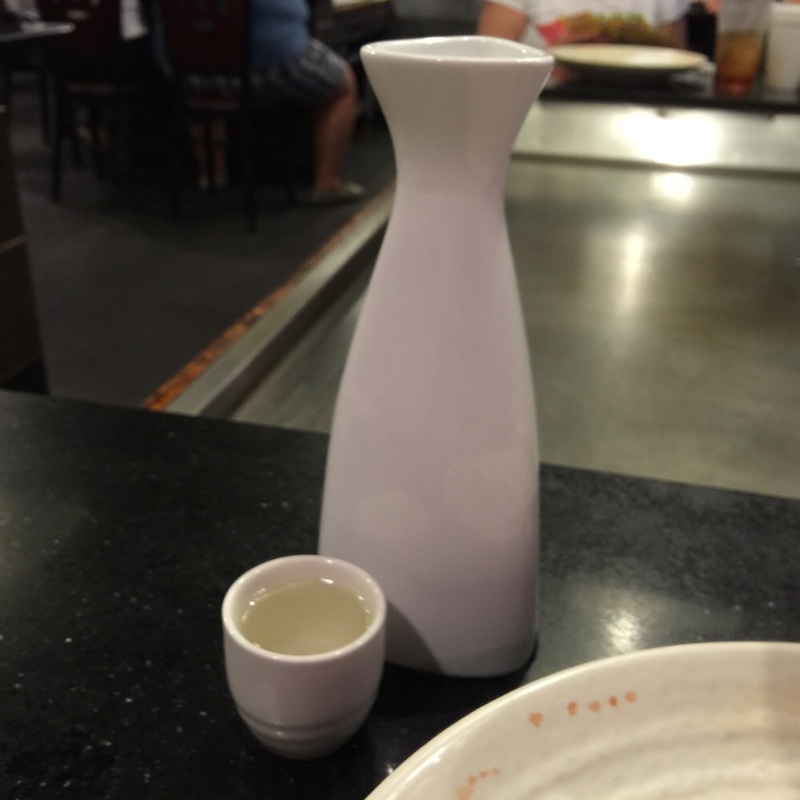 I ordered Sake because I always order Sake with either Sushi or Hibachi. And when it arrived it was served hot in the carafe with two small cups. Traditionally, Sake should be shared and each party should pour for the other though after the first cup I usually forgo that part of the ritual. The Sake tasted clean and clear and slightly sweet with a little bite at the end. I enjoyed that. For those who don’t know Sake is sometimes referred to as rice wine which is actually misleading. Sake isn’t fermented from rice like wine is from grapes but it is actually brewed like beer. 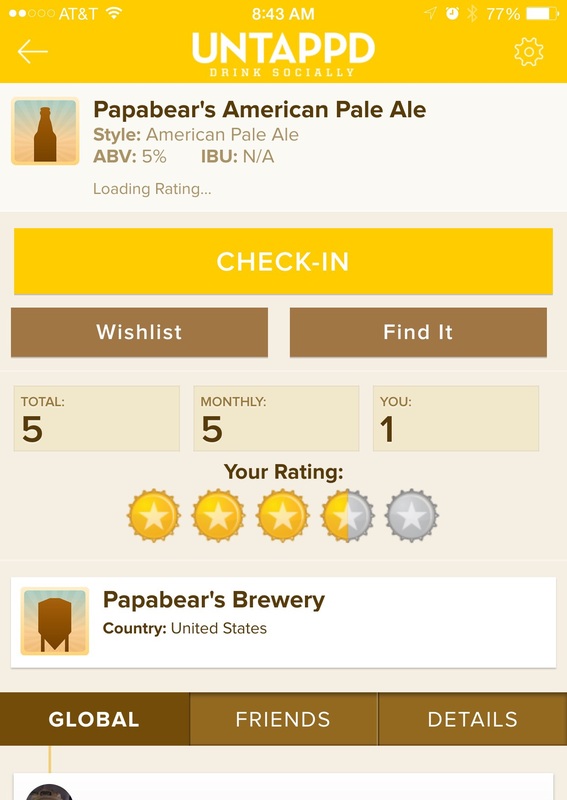 You can even find some Sakes on Untappd. The waiter took our food orders and I ordered the Yaminiku, which is sliced beef with mixed vegetables in a special sauce, according to the menu. Something I hadn’t had before so I figured why not try it. The waiter got the rest of the tables order then was off to get the Miso soup. He came back with the soups and was one short for the hibachi and had to get another. Hint number one. When the salad came, again he was one serving short and had to go back for another. Hint number two. While we had our soups and salads I noticed that there didn’t seem to be a lot of staff on hand. Hint number three. The hibachi cook came out with his cart of prepared items for cooking introduced himself to everyone and then confirmed the food orders. When he got to me he said, “Steak and Chicken.” To which I shook my head and replied, “Yaminiku”, or as close to that as I could remember and pronounce correctly. He looked down at his paper and obviously couldn’t find my order, then went on to confirm everyone else’s. He came back to me and asked again if I had steak and chicken and again I replied that I ordered Yaminiku. He excused himself, said he’d be right back and took his cart back to the kitchen. Hint number four. After a short period he returned with his cart and said, “Ok, here we go!” then began the routine of prepping the hibachi. If you’ve been to a Japanese Steakhouse before then you know they begin with the eggs for the stir-fried rice, then any vegetables that need cooking, followed by low mein noodles and then start working on the meats. As he went around the table again checking on everyone’s order and confirming it with the meats he put on the hibachi, when he got to me he still had no food to confirm. When he began portioning out the rice and low mein he obviously didn’t have enough for my plate. Hint number five and the last I needed. While all the other patrons at our hibachi were eating off of their plates I sat there with an empty plate feeling like Oliver Twist trying to ask for more gruel. I believe the cook saw my perturbation and began calling for the waiter who took our order. After he finally showed up and was asked where my food was I realized that he had dropped the ball big time here. And so did he. He ran off toward the kitchen (I am assuming). And the cook continued working on the meats that everyone has ordered. He finished those quickly and began dispensing them to the various plates around him. By the time he was done I was still sitting there with an empty plate. He did a quick clean and thanked everyone, then looked at me apologetically and said he would find out where my food was. After another few minutes, I told my friends that this was ridiculous and that I was about to get pissy with the manager and called for someone to get him to our table. It took another few minutes and just before he came over a different person came up and put my plate of food in front of me. When the manager arrived I told him that I was getting ready to complain about not having any food but that it was there now. He nodded his head and went away to leave me to my eating. The food was good but not any better then any other similar restaurant I have been too. Once we all finished we still had to wait around for checks to come out which is unusual. Which was another telltale sign that the place was understaffed that evening. This was confirmed again as we left and I could see a lot of folks in the Sushi bar looking like they were waiting for things as well. I will give the place credit in that my bill was probably only 40% of what it would have been otherwise. And the waiter did apologize to me for his mistake. And the cook was not to blame for my dish not being included in the cart. He was working from the list he had been given. This is a clear sign of bad management. The restaurant should not have been that understaffed to begin with. If the waiter was new or needed help he should have gotten it. Or maybe he needs another line of work to be in. And part of the benefit of going to a hibachi is getting to watch them prepare your food for you. My plate was done in the kitchen so I don’t even know who prepared it. I have heard some folks tell me over the last couple of years that they liked this place. The last time I was here it was ok. Nothing outstanding but nothing wrong either. And your experience with this place will hopefully differ from mine if you go there. But I won’t be going back. These two places are perfect examples of what makes for a good experience. The Samurai Japanese Steakhouse and Sushi Bar was a perfect example of what you don’t want a patron to experience. The food was fine and the cook entertaining but the whole experience was a very big miss. Yet, Curia on the Drag while first entering I was dismayed by only seeing three taps, the overall experience makes me want to go back again. A definite hit. 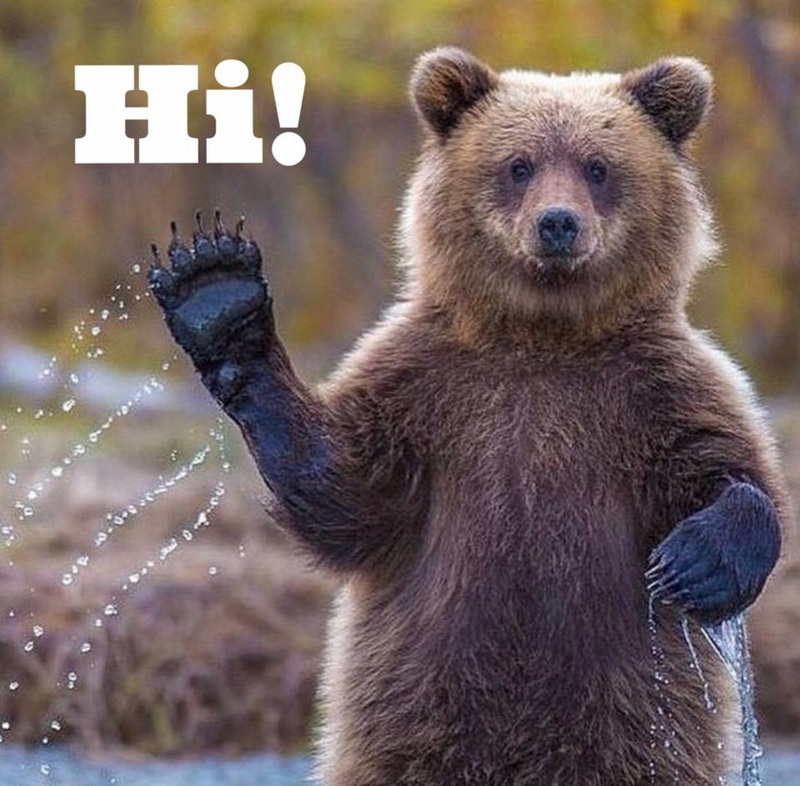 Here’s hoping your weekend began better. 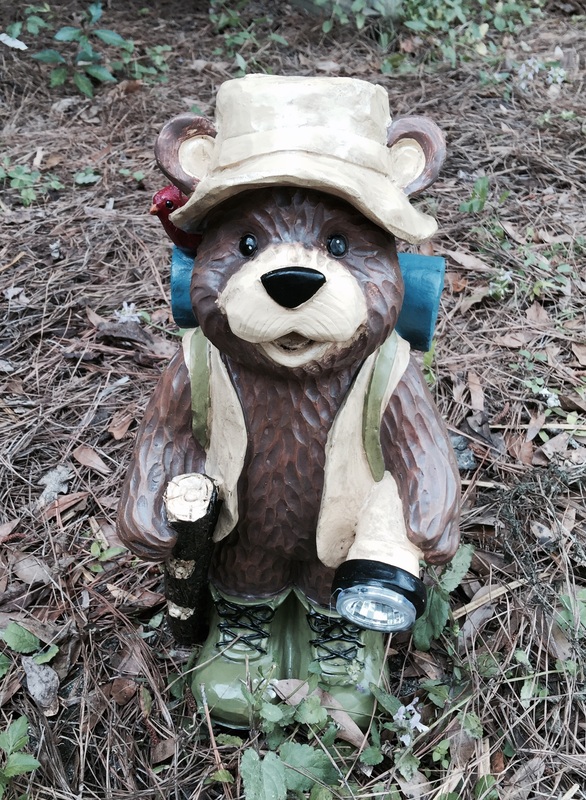 Brew Parties, Food Parings and Bears… Oh My! If you read my last post you should know that I was planning to have a little Beer Sampling party this weekend and had some concerns about how my first batch would turn out. 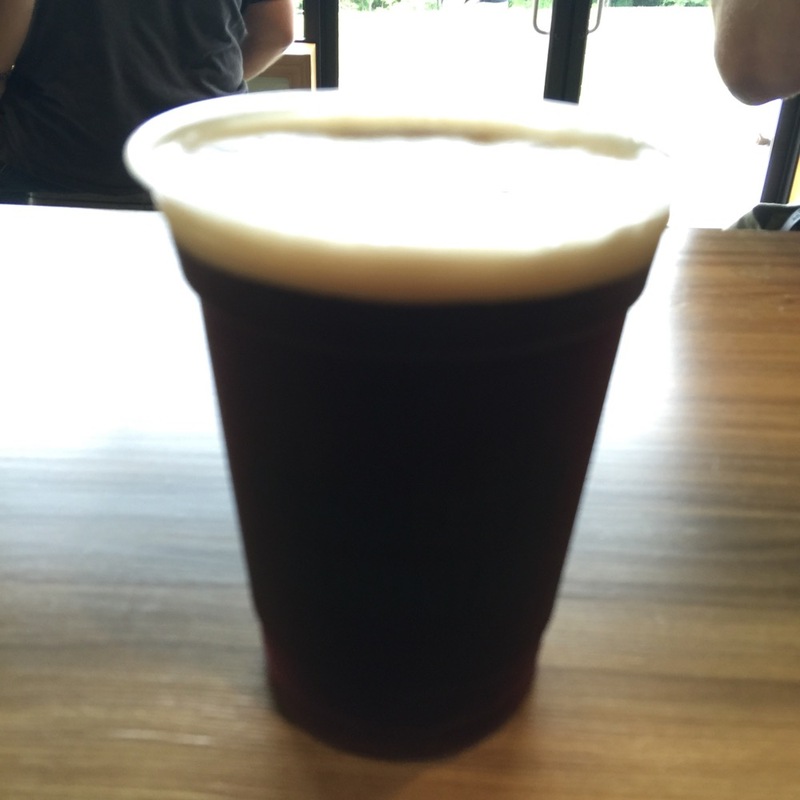 I was also pondering about whether or not to continue homebrewing or to leave it to others. 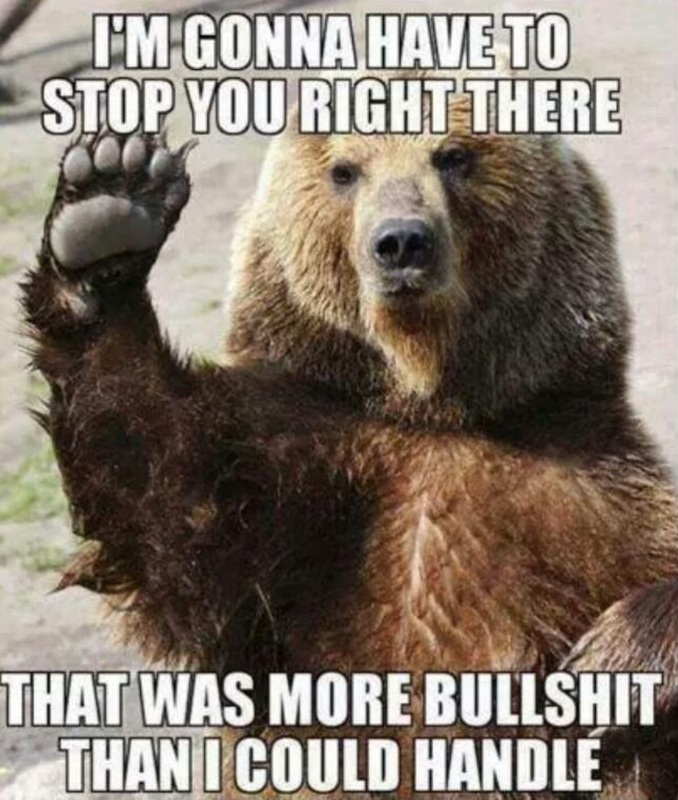 Before I divulge my decision on that I would like to comment on the subject of Food Paring. I know there may be some folks out there who have doubts about the merits of matching foods up with beverages. But let me share some of my experiences in the last week or so to try and sway your thought processes. If your idea of cheese is limited to the melted variety served over nachos or a grilled cheese sandwich, and by beer you are referring to one of the popular American lagers then you’re correct in that paring isn’t that important. But I’m talking about Craft Beer, beer that comes in so many varieties and flavors that paring it with food is very similar to wine paring. I’ll explain. At the dinner, which I attended with Rowdy and the Cooler, the first course was a Buckwheat Blini served with Caviar and a Vinagered Cucumber. It was pared with a Sparkling Pinot Blanc. The wine wasn’t too dry like some champagnes and its slight sweetness complimented the slight saltiness of the caviar. The second course was Scallops in white wine sauce served with a Roland Tissier Sancerre. The scallops were tender and delicious and the wine enhanced their flavor. They wine stood well on its own as well. The salad was made of Arugula with a vinaigrette. It was served with a Les Rocailles, Bonaface Apremont. The wine itself was just okay but a good paring with the salad because it neutralized the peppery after taste that the salad had. The entrée was a roasted tenderloin of beef with Béarnaise Sauce, Lyonnais Potatoes and Asparagus spears. The accompanying wine was a Chateau Haut-Goujon, This was a really great Bordeaux that not only stood well on its own but enhanced the flavors of the entrée. The dessert was a Grand Marnier Soufflé and was accompanied by a Chateuneuf de Pape. This wine alone is one of the best reds out there. It added to the richness of the soufflé. All of these wines were paired with a dish that not only were enhanced by the wine but complimented the wine as well. Many of the craft beers out there now can be as complex and flavorful as a good wine. It follows that paring them with the proper food can be as difficult. Back before craft beers became popular and Lagers were your most available if not only choice the types of foods that went best with beer were usually snacks with a higher salt content like chips or pretzels. Now with the rise of craft beer and myriad flavors available a lot more foods can accompany a brew for consumption. For instance, normally beer and ice cream don’t mix, either in a glass or as an accompaniment. But take a nice rich malty stout and it complements ice cream and other sweet foods as well. While an IPA is usually bitter and sometimes a pretzel will make it seem even more so and not to the betterment of the flavor. As I mentioned earlier I had a small get together this last weekend out on my deck. I brought together some samples of beers from out-of-town breweries I visited during my recent travels (see Beer-cation Pts 1-4). And while I was brewing a wheat beer that afternoon we sampled an American Pale that I had brewed a couple months ago. 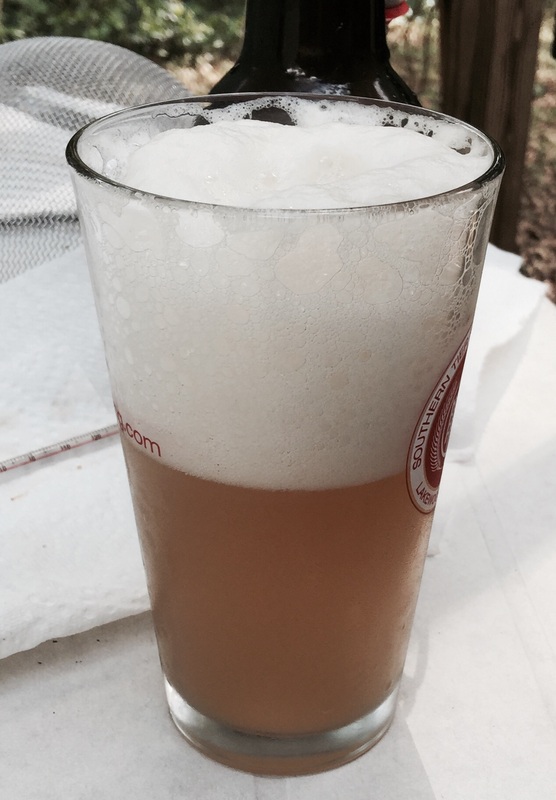 I waited to sample my first homebrew until I had other people present because I wanted to get their honest reaction. The first comment I heard was “Wow! You brewed this??! This is good! !” And I have to admit I agreed with him. I was envisioning people doing the spit-take or pouring it into a planter. Instead I heard a few compliments on the beer. There were probably a couple people who didn’t think it was as good as some but then everybody’s tastes are different. And to be honest it was a little too carbonated so the amount of honey I added during to bottling was probably a little too much for the amount of beer I made. But that just goes to show you that even a mistake can still taste good. After the homebrew I served a Bier de Miel, a Belgian flavored with honey, which to no surprise was very sweet. After the belgian I brought the TimberCreek Black Bear Porter, which has definite coffee hints. That was followed by the North Country Brewing Keystone Swankey, which is a Steam (or Common) Beer. I had never had one of these before I had sampled this at North Country Brewing but if this is an indicator of how Steam Beers taste then I say keep making more of them. My fellow beer samplers at theory seemed to agree. From the Swankey we went to the Green Man Brewing samples I had brought back. We started with their ESB, which stands for Extra Special Bitter. But I didn’t find this to be bitter and thought is was a well balanced ale. Another point my friends agreed on. After the ESB we went to the Green Man Forester, which is a seasonal stout. This is one of my favorites of the night but I have a thing for porters and stouts. I believe the others liked it but not as much as I did. After the Forester I served a Liefman’s Cuvee Brut which was bottled like a champagne and almost tasted like a sparkling wine. I liked it but it was definitely not my favorite of the day. By the time we had gotten to the middle of the beer list I had already added hops to the boil and then pitched the yeast into the carboy and set it in a dark closet for fermenting. In a couple more weeks I will bottle this and then wait at least two more weeks before are going for another beer sampling. We sampled several different foods while doing this. A friend of mine brought some fruits and cheeses to snack on. And I had prepared a homemade quacamole to go with some local tortilla chips I had purchased. 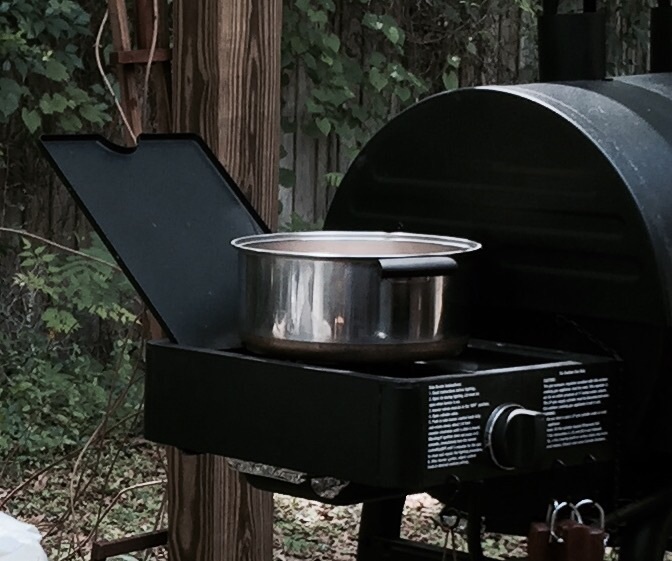 After I was done with the brewing I fired up the charcoal side of the grill and began cooking some beer brats (made with beer from local Swamp Head Brewery), Smiths hotdogs from up in Pennsylvania, and some wings that I coated with olive oil and dusted with a blend of spices. I also had home Cowboy Beans, my sisters homemade sauerkraut, and a hotdog meat sauce in the crockpot. Another friend brought a cheese dip with sausage and potato salad, and Rowdy brought wines for the non-beer drinkers to have. Now we didn’t do any food paring in an official capacity but I did notice that some of the foods went better with some beers than others. All in all we all had a good time catching up with each other, eating and supping suds. And as is bound to happen when a bunch of us get together and imbibe the philosofying starts. Even when it started raining we kept enjoying the day (thanks to Blaineanator bringing a canopy). It was an afternoon long happy hour that really didn’t stop until the sun started setting and the man-eating mosquitoes came out. I earlier mentioned being unsure if I would continue brewing as a hobby or just leave it to others. I not only want to continue I want to do more. The Blaineanator mentioned having supplies from making wine and wanting to learn to do this. So maybe we’ll just have to blossom outward. 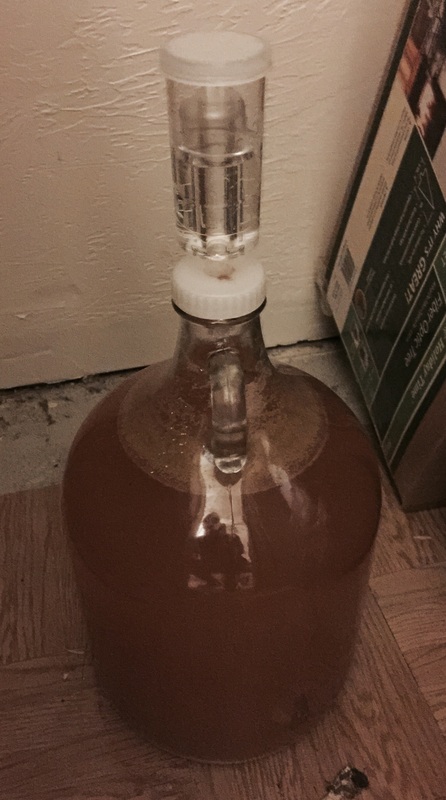 Carboy of wheat beer fermenting. 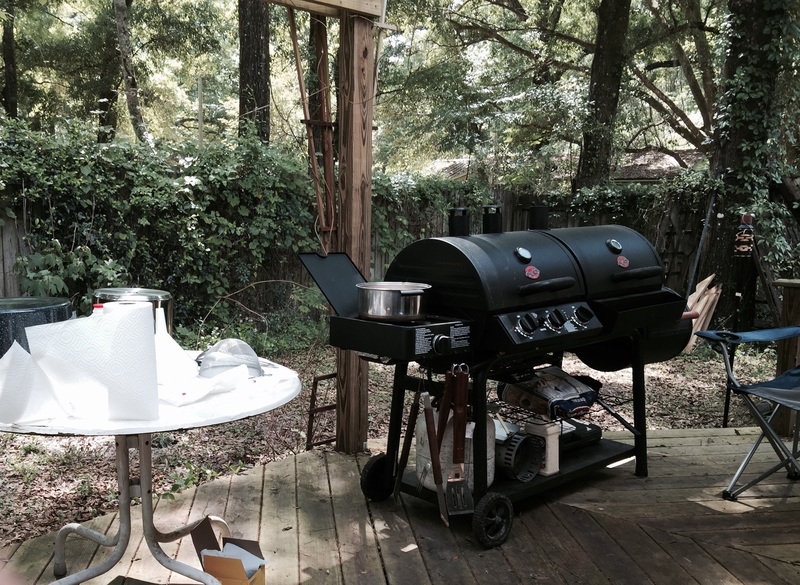 Posted on April 7, 2015 Categories home brewing2 Comments on Brew Parties, Food Parings and Bears… Oh My!